I picked up a Groot Disney Infinity figure awhile ago, but he looked a bit lonely sitting on my shelf all by himself. Solution: Add the rest of the Guardians of the Galaxy to keep him company! Hasbro makes 2 inch Guardians of the Galaxy mini figures that are perfectly scaled to the Infinity Groot. I bought a bunch of the two packs and crazy glued the rest of the Guardians to Groot’s base. Since the Infinity style doesn’t have much detail, I added some tree bark lines in green and brown to give Groot a more textured appearance. 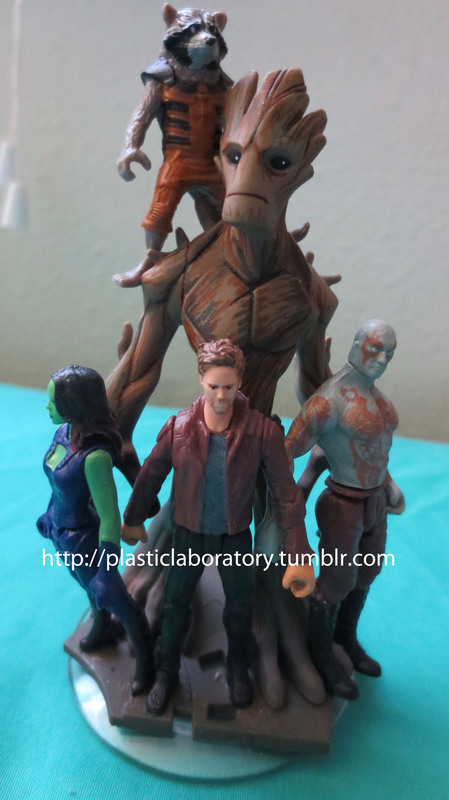 If you want to make this easy custom figure yourself, try wedging Drax’s feet between Groot’s toes. This will help keep him place and make it easier for the glue to dry. 🙂 You can also pull off Star Lord’s head and make the clothing combination that suits you best (masked or unmasked, long coat or jacket).